Come to Old Clinton and take a step back in time on May 2 & 3, 2015, when re-enactors from the Southeast recreate the Battles of Sunshine Church, which took place in July of 1864, and Griswoldville, which took place in November of 1864 during Sherman’s March to the Sea. The 16th Georgia will again sponsor rapid fire as well as ultimate soldier/U.S. & C.S. authenticity contests and unit drill competition this year.The entire event takes place in the Old Clinton Historic District, which is listed in the National Register of Historic Places. Self-guided walking tour information will be available, and guided tours are available by pre-reservation. Gates open at 9:00 A.M. Battle at 2:05 each day. Admission/Contribution each day: Adults – $5; Students 18 and under $3; Children under 6 – Free. Memorial service – Free. 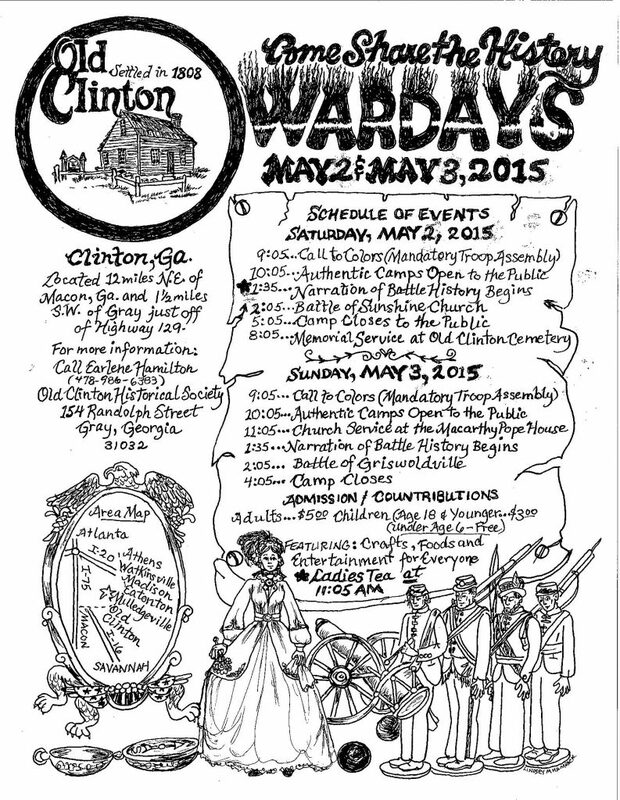 Clinton is located 12 miles NE of Macon, 1-½ miles SE of Gray, one block west off US Hwy 129. For more information contact Earlene Hamilton at 478-986-6383 or the Jones County-Gray Chamber of Commerce & Visitor’s Center at 478-986-1123. This week, take action to prepare for a flood, practice emergency procedures and learn more about local threats. Opening day for JCAL baseball and softball season is this weekend at the South Complex off of Hwy 49. Please come out and support these young athletes. Jones County Fire Chief Don Graham is reminding everyone to change the batteries in all smoke alarms and carbon monoxide detectors in their homes when changing their clocks this weekend. We spring our clocks ahead, so take a few minutes out of your day to do something that could very well save the lives of your loved ones. The Jones County, Georgia Annual Financial Report for fiscial year ending August 31, 2014 is available for public view.